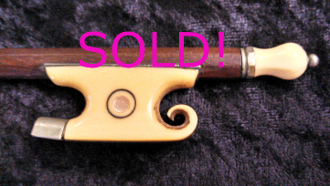 This full size violin bow for sale was factory made in Germany sometime around 1900 or slightly earlier. It was made for distribution by American catalogs and has many unique characteristics. The bow is made of brazilwood but is stained to look like it is made of snakewood. The frog is a fancy ivory frog with a Parisian pearl eye and a twist. It is nickel mounted. The button is also ivory. The stick itself is round, straight, and strong. The camber is good. The bow handles reasonably well for an old factory bow, though it does not perform as well as some new bows. Thus, it would make a lovely collectors item or fun bow for a not as serious violinist.